Once we have healed and honoured our own pain, then how do we forgive those who have hurt us? I hope my previous article on forgiveness last month was useful to you! The second realisation I wanted to share with you today was about the next step into our forgiveness journey. Once we have healed and honoured our own pain, then how do we forgive those who have hurt us? I’m sure you’ve experienced yourself that simply “thinking” or making a rational decision to forgive someone who has deeply hurt you is often not enough. What is actually required is empathy. Empathy means being able to step into someone else’s shoes, feel, see and experience things as they do. Often we conceptualise empathy – that means we think we step into their shoes (an experience coming from the mind) instead of actually apprehending the world as if we were them (an experience coming from the body). This is because it is actually quite difficult to step into someone’s shoes, given how different our belief systems, past experiences, cultural background and history – to name a few – are. I found that the best way to use empathy in a forgiveness work is actually in an altered state of mind such as hypnosis, visualisation work or meditation. This is where our mind is entering a different brain wave (Alpha brain waves) that allows changes to happen at a deeper level. Once we are able to enter that “healing” state of mind, we can begin to experience life as if we were someone else. But let’s pause a moment. We are actually talking here about someone who you are trying to forgive – that means someone who has hurt you. And depending on the degree of hurt, you might be extremely reluctant to step into their shoes…If that’s the case, it may simply mean that you are not ready for that stage yet, that you still need to heal your own wounds, as I explained last month, before being able to move onto the next step. Before we continue, I also would like to strongly advise you do this work with a professional therapist if you are working with any type of abuse, as I don’t believe this is healthy to do this on your own. In a nutshell, the forgiveness exercise I suggest involves visualising the event where you felt hurt, and stepping into the shoes of the person who hurt you and who you are wanting to forgive – in order to understand what they felt that led to their hurtful behaviour. There is much more to it than this simple summary, but this is ultimately where forgiveness will come from: understanding they were behaving to soothe their own suffering without necessarily realising they were hurting you. Please be assured this is not to condone, justify or excuse their behaviour in any way. But simply to understand the complexity of emotions involved and to heal ourselves and our own pain. And it made me realise why so many adults might be struggling to be there emotionally for children. Because perhaps, in that moment when they should do the right thing, they are in emotional distress themselves and can’t provide the support a child needs…This is just one example based on my own experience of what we might learn when we are able to step into someone else’s shoes and that might not resonate with you, but the point is that there are a lot of insights available to you when you explore your own history. You may feel angry hearing this. You may have been hurt or damaged a lot by adult figures in your past. It may seems totally unfair to try to understand their suffering, where they should be the ones doing the work. I believe forgiveness is a journey. It is not a quick fix, it is not an easy step, especially if your pain is very deep. But by holding on to our anger, our resentment, our hurt – we damage ourselves. Often we unconsciously want to punish the other person by not forgiving them, but ask yourself: who is suffering the most? And is it worth it? And ultimately, how does punishing make our pain disappear? Are you sure this is the solution to banish your own suffering? Remember that forgiving doesn’t even mean letting the other person know you’ve forgiven them. You are doing it for yourself. To let go and free yourself from the past. You may even choose to never contact them anymore nor let them know you’ve moved on. It’s not about them. It’s about you. 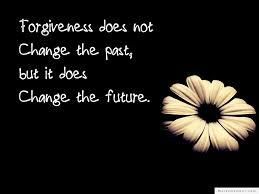 Of course, forgiveness is not solely about our past. It can also be applied to our current life. But the idea is the same: use empathy to try to understand and ultimately let go. I have seen clients unable to forgive, being eaten away by their hatred. But remember, no amount of anger will ever give us the past we wish we had. I hope you found this article useful, and feel free to drop me a line if you wish to discuss it further. I also strongly recommend Louise Hay‘s books that offer a lot of useful exercises to help you forgive and help us in this quest for peace. Previous Previous post: Why is it hard to forgive?